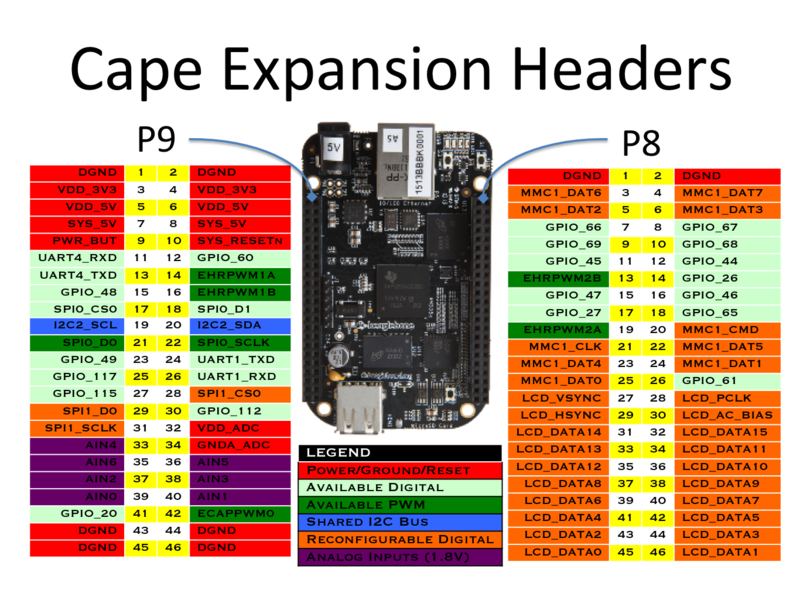 In this post I will describe how to use sysfs to access the GPIO pins in the BeagleBone black, this should also be compatible with the recently released BeagleBone green. From Wikipedia: "sysfs is a virtual file system provided by the Linux kernel that exports information about various kernel subsystems, hardware devices, and associated device drivers from the kernel's device model to user space through virtual files"
The BeagleBone black will expose GPIO pins via sysfs, and the location we will use is "/sys/class/gpio/". All the following commands are run on the BeagleBone after starting an ssh session. To use a pin we must export it, to release a pin we must "unexport" it, we achieve these actions by writing the pin's numeric value to the export/unexport files. Now that our pin 60 has been exported its primed and ready to be used, within the "/sys/class/gpio/gpio60" folder we only care about two files: direction and value. Now we can turn the LED on pin 60 on and off by flipping the value from 0 to 1 and vice-versa. Now you can see 0 and 1 on the screen as you press/release the button. Now we can make sure no gpio60 or gpio44 folders exist under "/sys/class/gpio/"